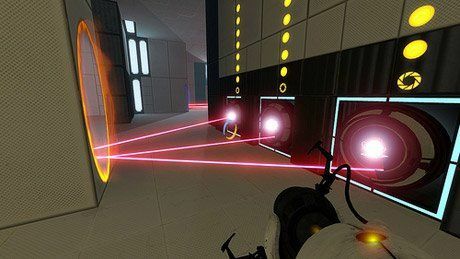 Screen capture from Valve Software's Portal 2, which students used to design a lesson. At Sammamish High School, our staff has dedicated our professional development to building expertise in the key elements of problem-based learning. Previous blog entries by my colleagues have given an overview of this process, as well as exploring how we include student voice and work with authentic problems. Another crucial element of successful problem-based learning is using authentic assessment throughout all stages of a unit to constantly evaluate and improve student learning. So what then makes an assessment "authentic" (or not)? Something is considered authentic if it is a believable replica of something else with significant value. You're not eating at an authentic ethnic restaurant if the food doesn't accurately represent the culture it is modeling. In our classrooms, this translates into creating tasks, projects, structures and learning environments that mirror those seen in the real-life problems our disciplines address. Authentic assessments analyze student learning in a manner that is consistent with how our disciplines function outside of an academic environment. I was fortunate to have the opportunity to gain hands-on experience using authentic assessment when I stepped outside my comfort zone and joined our teaching team for our Starting Strong program (full disclosure -- I live a "cushy" life as a high school music teacher). Starting Strong is an intensive seven-day summer program open to all of our students but largely targeted toward those who would be the first member of their family to attend college. In addition to a strong foundation of study skills, students participate in a problem-based learning group that partners with a local industry professional. With my colleague Adrienne Curtis Dickinson, I partnered with Valve, a local software company and the creator of many popular games. Students in our group were tasked with developing a lesson plan demonstrating how the video game Portal 2 could be used to teach a curricular concept of their choice to an eighth or ninth grade class, as well as justifying why using the video game would be superior to traditional teaching methods. You can imagine the students' excitement when an employee of the Valve company visited us the first day to pitch the task and explain why their answers to the problem would be something the company was genuinely interested in learning. The first day of the program, students were given a job interview where they explained what strengths they could bring to their team. We used this information to decide how to build our collaborative groups. Each morning, the project managers from each group had a quick "stand-up meeting" outside the door to the classroom, where they briefed us on where their team was in the project and detailed their specific plans for the day. At the end of each day, teams sent an email report to our partner at Valve (copied to their teachers), who in turn gave them feedback and suggestions the following morning. Students gave practice runs of their final presentation first to classmates, then to teachers, then to their parents at the final family barbeque, getting feedback every step of the way. On the final day of the project, the students traveled to Valve world headquarters in our hometown of Bellevue, Washington, where they presented their project to the education director of the company. None of these steps fit the mold of traditional testing or assessment, but each activity gave us incredibly valuable information. We were able to adjust our lesson plans and instruction each day, and gained many ideas of how to improve student learning the next time around. Students in our Starting Strong program did not receive grades or class credit, nor were they required to show up and be there the last two weeks of their summer. I'm happy to report that they "bought in" to our authentic tasks and authentic assessments, and we witnessed a high degree of student motivation. They applied themselves to polishing their work to a level that we dream of seeing in any of our classrooms during the school year. At Sammamish High School, our staff is learning that students rise to the occasion when they feel their work has real value outside of an academic exam, and mirrors what is done in real professions outside of the school. Many of us bring in community members to evaluate student work, helping these young people connect what they do here to life outside of school. We've seen students who were previously unmotivated by letter grades buy in when they were asked pitch to a real-life "client" why their project was the best solution to a problem. In my music classes, my goal is to frame tasks given to students as part of the authentic performance cycle that real musicians follow. When we do comparative listening, I don't present the task as an assignment their teacher is requiring, but rather as an important step that all serious musicians do when preparing for a public performance. When it's working, students become empowered to take ownership and find more listening examples on their own, and I become less of an instructor and more of an expert resource for them. I can tell it's not working when I get questions like, "How many points is this worth?" or "Is this going to be on the test?" The gold standard for authentic assessment is when students begin to develop their own plans for holding themselves accountable and measuring the success of their endeavors. Our staff is still discovering how to best translate cutting edge assessment techniques into old-fashioned reporting practices. The answers aren't necessarily obvious or easy, but our early returns suggest that the gains in student learning are certainly worth the effort. Have you been able to incorporate authentic assessment in your classroom? Please share your experiences in the comments area below. Editor's Note: Visit "Case Study: Reinventing a Public High School with Problem-Based Learning" to stay updated on Edutopia's coverage of Sammamish High School.